one - eight = ? six + eight = ? The SECUMAX CARDY is another of our nimble paper and foil cutters. Its compact shape allows for curved cutting: its short nose won't annoy. Its 2.5 mm wall thickness makes it particularly slender, and thereby agile. 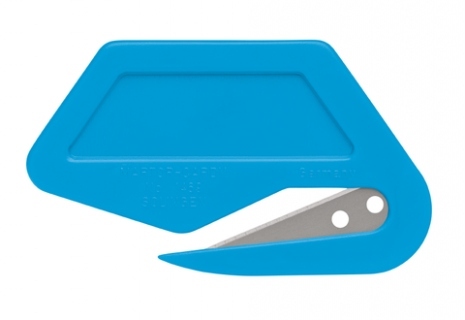 You can guide this cutter through very thin slots - particularly when cutting film. This feature is especially appreciated in the automobile industry. Your cutting tool is fitted with a rustproof Solingen quality blade. The TiN coating ensures that you can cut easily and more effectively for longer with your SECUMAX CARDY. 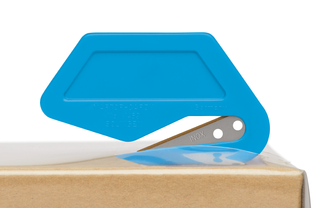 The SECUMAX CARDY is a disposable cutter. You cannot change its blade. It will also not get lost in the heat of the moment. Both these factors contribute to your safety. You can easily pierce the cutting material with the nose of the SECUMAX CARDY. The design of the cutter ensures the material does not snag when running the blade through it. At 4.7 mm, access to the blade is comparatively wide. You can therefore also cut somewhat thicker material easily. This increases the scope of usage of your cutting tool. The injected and concealed blade will neither come close to you nor to your goods, which means no harm to you and no damage to your things.